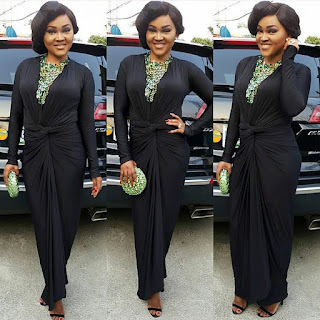 CHECHESMITHNATION : Actress Mercy Aigbe Gentry Was All Stylishsly Wrapped-Up At The Sun Newspaper Awards! Actress Mercy Aigbe Gentry Was All Stylishsly Wrapped-Up At The Sun Newspaper Awards! The pretty actress/Fashionista Mercy, rocked this lengthy black wrap dress by Ejiro Amos Tafiri,paired with strappy heeled sandals to the Sun Newspaper Awards. We love her pretty neck-piece and matching purse.